Our food drive provides a direct connection between our church and the people in our community who are hungry. Local food pantries are struggling to keep food on their shelves. 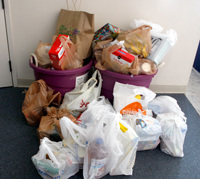 You can help by bringing in non-perishable food items and placing them in the bins located in front of the Nursery. Let’s fill those bins beyond capacity! Let your giving and generous hearts be touched by our neighbors in need in our community. Thank you for your continuous generosity in providing for our community.